Largest Filipino life insurer, The Insular Life Assurance Company, Ltd. reported consolidated revenues in 2013 of P19.3 billion, up by 7 percent from the previous year, with insurance revenues accounting for 65 percent of total revenues. 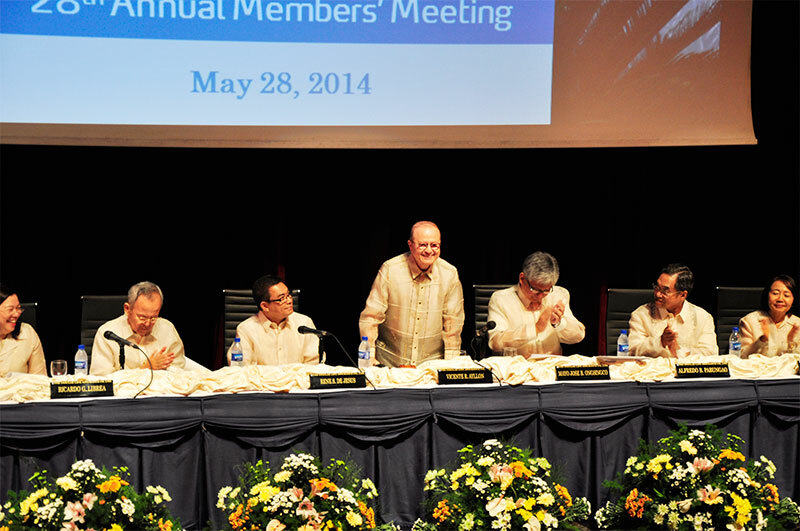 At the Annual Members’ Meeting held recently at the corporate headquarters in Alabang Muntinlupa, Insular Life Chairman of the Board and Chief Executive Officer, Vicente R. Ayllon, reported on the gains of the Group led by parent company, Insular Life, which recorded a robust 40 percent increase in new business premiums to reach P7.3 billion, and 20 percent increase in total premiums amounting to P11.3 billion. This growth in both new business and total premiums was attributed to the company’s strong drive for product development and product innovation, higher productivity of all its sales units across the country, and continuous improvement in its sales and customer servicing capabilities. In 2013, Insular Life launched two structured products, Wealth Assure, a peso-denominated product where regular premium payments are required to enjoy the benefits of lifetime protection, I-Dollar Asset Plus, a structured product hinged on the performance of the Asian markets, and I-Dollar Asian Gems, a structured product hinged on Asia's emerging companies. It also offered new multiple pay investment unit-linked products Wealth Assure Education, an insurance plan that maximizes the education fund’s earning potential; and I-Pinoy Pro Save, a 25-year to mature product issued on a guaranteed basis to enable overseas Filipino workers to save. The company also reported consolidated assets up by 6 percent to P94.8 billion from P89.6 billion the previous year. It paid a total of P8.3 billion in total policy benefits, including dividends, claims, surrenders maturities and survivorship benefits. “We also set aside P49.6 billion worth of policy reserves to pay for future claims. With a net worth of P27.9 billion, among the highest in the industry, our Company’s reserves-to-business-in-force ratio now stands as the highest in the insurance industry,” Ayllon reported. The company’s consolidated net income, however, dipped by 25 percent to P2.4 billion from P3.2 billion a year ago, due to the pre-termination of corporate loans of some of its borrowers, and lower dividends earned from the company’s strategic investments. “Notwithstanding our impressive sales performance in 2013, our bottom line dropped by a quarter percent because some of our corporate borrowers opted to pay their corporate loans ahead of term maturity to refinance and take advantage of the prevailing low interest rates. Also, one of our major strategic investments opted to defer paying dividends to its shareholders in order to internally finance its business expansion plans. Insular Life is the largest Filipino life insurance company and in the top three industry-wide in terms of assets and net worth. It continuously complies with and easily passes all the annual requirements of the Insurance Commission, the regulatory body of life insurance companies in the Philippines, in terms of Margin of Solvency, Capital Investment, Reserve Investment, Minimum Statutory Net Worth and Risk Based Capital Ratio.